Engaku-ji is one of the most important Zen Buddhist temple complexes in Japan. It is situated in the city of Kamakura, in Kanagawa prefecture to the south of Tokyo. It is very close to the Kita-Kamakura railway station on the Tokyo to Yokosuka line, and indeed the railway tracks cut across the formal entrance to the temple compound, which (showing Chinese influence) is by a path beside a pond which is crossed by a small bridge. The temple was founded in 1282 by a Chinese Zen monk at the request of the then rule of Japan, the regent Hojo Tokimune after he had repelled a Mongolian invasion in the period 1274 to 1281. Tokimune had a long-standing commitment to Zen and the temple was intended to honour those of both sides who died in the war, as well as serving as a centre from which the influence of Zen could be spread. 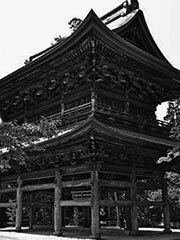 According to the records of the time, when building work started a copy of the Engaku-kyo, the sutra on Perfect Enlightenment, was dug out of the hillside in a stone chest during the initial building works, giving its name to the temple. The fortunes of the temple have waxed and waned over the centuries. Its present form is owed to the Zen priest Seisetsu, who reconstructed and consolidated it towards the end of the Edo era. In the Meiji era, Engaku-ji became the chief centre for Zen instruction in the Kanto region; Kosen Roshi and Soyen Shaku were successively abbots in this period, and Daisetz Teitaro Suzuki was a student under them. Zazen courses are still held in the temple. Ōgune (1301), at 2.5 metres tall the largest of all the many temple bells of Kamakura. Of these, Shari-den and Ōgune have been designated as Japanese national treasures. There is a small charge (as of 2005, 200 yen) for visitors to enter the temple complex, and additional similar charges to enter a few of the buildings. Booths selling tourist items are located near the entrance, below the San-mon, and there are refreshment facilities in the garden of the Shari-den and at the platform where the Ōgune bell is located, from where there are extensive views across the valley to other temple complexes in the Kita-Kamakura neighbourhood, such as Jochi-ji and Tokei-ji. Richmond, S., & Dodd, J. (2005). Rough guide to Japan, 3rd edn. New York: Rough Guides.